“Is it wise to ask the questions you always wanted to ask? 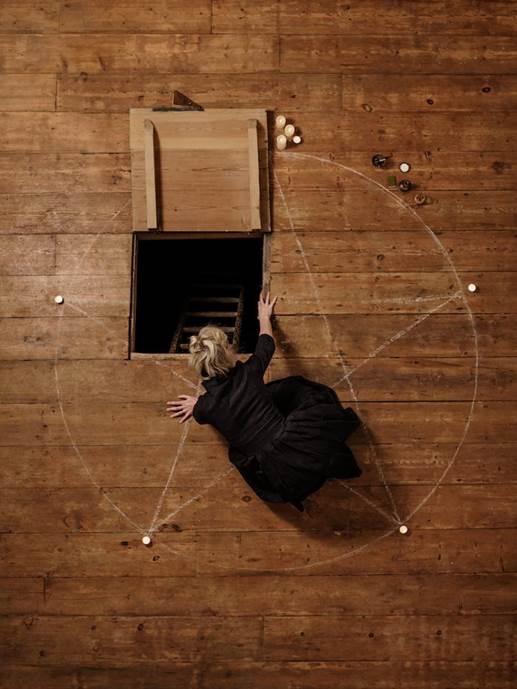 Let’s Summon Demons is a semi-immersive folk horror play in the round. It examines our attitudes to ritual, to revenge and to the uprising of female power. Can community lead to mob mentality? What are ghosts and demons and do they come from below or from within? If you stare into the abyss, can you come back? I am not big on immersive theatre and felt quite nervous walking up the narrow stair of the Old Red Lion Theatre however the minute I walked into the venue I felt very much at home. The air was thick with the heady scent of incense resin; the lighting was low and the haunting strains of `The Fiend Discovered’ from `The Blood on Satan’s Claw’ soundtrack greeted my ears – I felt that I was among my people. The intimate setting was perfect for this production with the semi-circle tiers of wooden benches carrying echoes of Victorian Operating Theatres. Before the performance begun we were initiated as a part of the evening’s entertainment with learning lines from an ancient sounding song, generating a communal drone, having our measures taken and some of us (it felt like we were definitely an `us’) being selected to be guardians of summoning spells. I say `before the performance’ but this was all really very much a part of the show. The scene was set – we had been invited to stay at an isolated guest house in the wilds of Wales that had once belonged to our host Rowan’s grandmother – Maggie. Through a series of light hearted conversations with the audience Rowan (a reference to Rowan Morrison from The Wicker Man possibly?) fills in the back story nicely and we find out that Maggie always thought the house haunted and in fact had a creepy experience one night alone in the house. We are gathered here to help mark the first year anniversary of the death of Rowan’s husband Allister’s (that other famous Allister – Mr Crowley – will give you a clue as to how this is likely to end up) and it also transpires that all the assembled (the audience) are witches, seers, cunning folk or occultists of some description…oh and we are all women! This first act is charmingly presented by Katy Schutte with a thoroughly engaging and quirky style that puts the audience at ease whilst drawing them in and making them laugh – there is quite a lot of laughter in the early part of the performance as fortunes are told usingTasseography (the forgotten art of fortune telling using biscuits) and well informed comments on the nature of the dark arts are perfectly pitched and delivered. Then comes the second act……. As previously mentioned the venue was a perfect match for the feel of the piece with its intimate, communal atmosphere and wooden floor which became an otherworldy canvas with the use of some very smart projections. Katy controlled the room expertly flipping from chummy to obsession bordering on possession and with good use made of some fantastic music that feeling of isolation, ritual and the paranoia of a skewed moral belief was always in the air….waiting for the Fiend to be discovered. A dark descent into the moral maze of mob mentality and its justification for extreme polemic and behaviour……a witch hunt carried out by witches. Folk Horror Revival – Firstly can you tell us a little about yourself – your background, how you ended up acting and writing and who has influenced you? Katy Schutte – I studied Drama then fell hard into the cult of long form improvisation. So hard that I studied in Chicago, wrote a book about improv and that’s mostly what I do. I spent a few years on the stand-up circuit too but prefer to do full shows and I love to collaborate. In comedy, I’ve always loved Bill Bailey, but I also adore writer/performers Tina Fey, Phoebe Waller Bridge and Rachel Bloom among others. For this show I was very inspired/influenced by Liam Gavin’s movie A Dark Song. It’s amazing. FHR – Do you consider your work to fit into the Folk Horror genre and if so what is it about it that you feel fits that label? KS – I was in a training coven in my early 20s, so it definitely influenced my real life! I’m quite Jungian in my beliefs though. My current show is folk horror as there’s a strong Wiccan vein running through it, we actually enact a ritual and there’s also a social and religious commentary which is strong in my favourite folk horror movies. I was researching witchcraft when I first came across the Wicker Man and it is so well pitched, accurate in terms of pagan ritual and belief and also scary and beautiful. There are a lot of elements that are not overtly called out or explained and I love that too. FHR – Can you give an outline of the content and of what your show is about? KS – The crux of my show is to address the a post-#metoo climate. Are we witch-hunting men? Should we? What does that mean? It’s set in a haunted Bed and Breakfast where Rowan – a practicing wiccan – has invited her female friends to join in a ritual marking her husband’s death one year after the fact. FHR – Do you have a particular process (ritualistic or preparatory) when you are writing a show? Any way in which you get yourself in `the zone’ or work up ideas? KS – Every show is different and there’s no one clear process. I certainly made sure I magickally protected the people collaborating on this one! Improv and just plain writing a first draft are useful ways to get started. A visit to Salem was inspiring too and my director John Henry Falle was amazing; especially getting me clear on the Lore of my show. FHR – So what is next? FHR – And finally do you have any particular shows that have left an impression on you (not necessarily Folk Horror) – and can you say a few brief words about it/them? KS – There is a company called Curious Directive that combine science fiction with science. Their show Pioneer was stunning and I’ve loved other works I’ve seen by them since. It’s powerful, makes you ask questions and beautifully conceived. 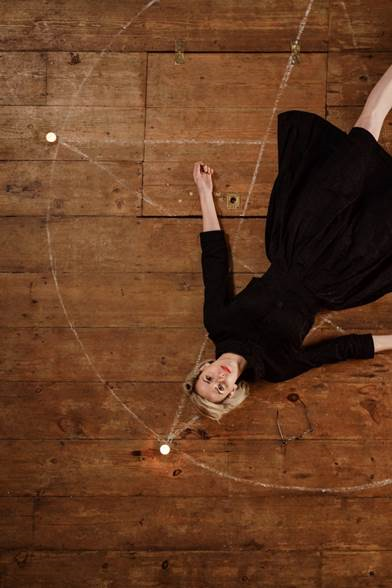 I think it is fair to say that there will be many folk who have been lucky enough to have seen Katy in `Let’s Summon Demons’ who would include it in their list of shows that have left an impression on them. Witty, twisted, sharply written and well informed if `Let’s Summon Demons’ comes around again we will be sure to let you know and I highly recommend you make sure you get a ticket.